Day 6: Re-create a restaurant meal. I am not impressed with today’s prompt. You want me to make a restaurant-quality meal… on a Sunday?! I might not be religious, but Sunday is my day of rest. Sure, I might spend a few hours in the kitchen making big-batch food to freeze or use in lunches, but it is decidedly not my day of recipe experimentation. Plus, today is a special Sunday. A good friend is hosting a fundraiser for Second Chance Wildlife Center at a local winery tonight, and I’ve got to bake a couple cakes to bring. Hmm… so much for that day of rest. Which is all a big long preamble to explain why I’m cheating on today’s MoFo post. Instead of actually re-creating a dish, I’m telling you how I would do it. But I’m not actually doing it. Because ain’t nobody got time for that. And by “nobody,” I mean me. And by “time,” I mean the inclination to shower, dress in real clothes, and run to the Asian market in between baking my Bundt cakes and finalizing my contribution for tonight’s silent auction, then come home and experiment with a dish I’ve never made before, then photograph it, then upload the photos, then edit them, then post about the whole shebang. Nope. Not happening. 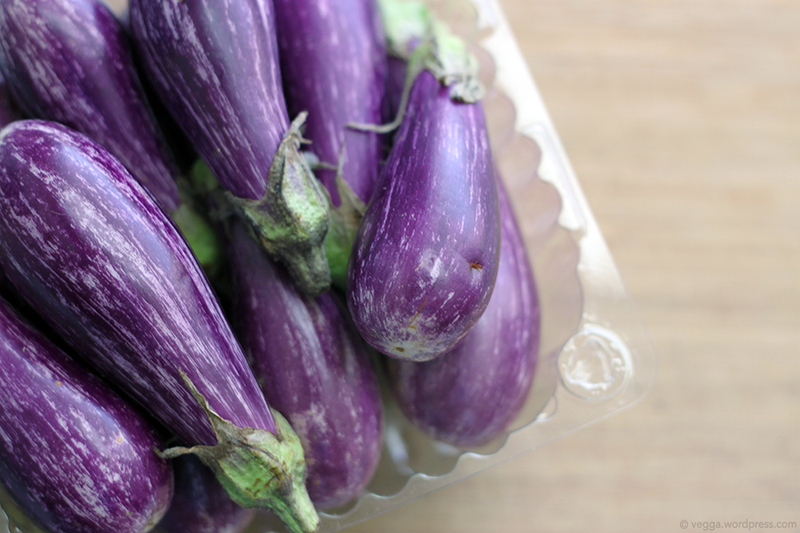 If I were using them in a Thai eggplant dish, I’d stop by the Asian market and pick up some black bean sauce. I’d also look for vegan fish sauce, but if they didn’t have it, I’d probably make my own. I’d check for Thai basil, but my homegrown regular ol’ basil would work just fine in a pinch. I would base the recipe on this one, but I’d take some notes from this recipe, especially for the sauce. I wouldn’t deep-fry the eggplant, though, and I might add some tofu for added protein. I’d serve it with brown rice, and it would be delicious. Apologies for the cop-out — I don’t intend to cheat on any more prompts this month! No cheat! Man I threw all my stuff in the blender and viola! I appreciate you drawing the line at Sunday being a rest day -though sounds like bundt cakes and awesome animal fundraisers leaves little rest. 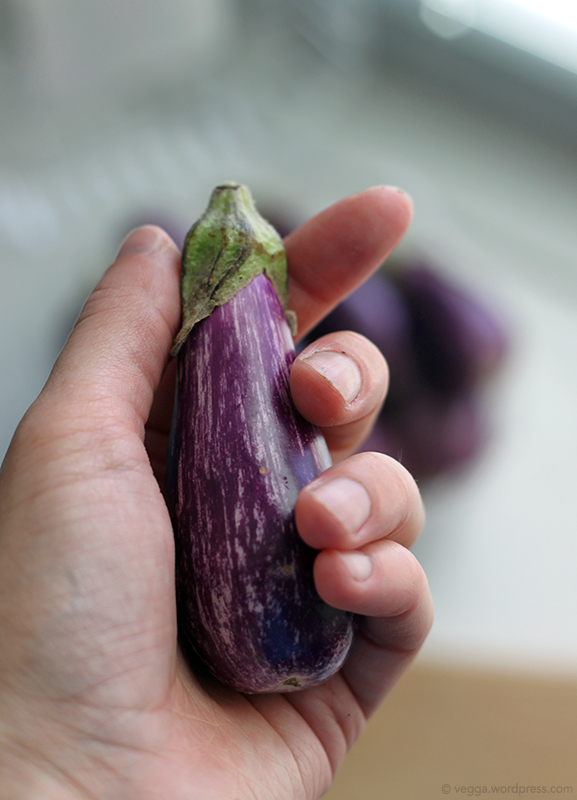 I saw pixie eggplants at the market but reached for a big honking deep purple eggplant instead. So cute, I can see the reluctance to eat them! I cheated, too and agree with everything you said. It was Sunday! I don’t think we have these eggplants available. They look beautiful.